Director – Brian Levant, Screenplay – Jonathan Bernstein, James Greer & Gregory Poirier, Story – Jonathan Bernstein & James Greer, Producer – Robert Simonds, Photography – Dean Cundey, Music – David Newman, Visual Effects Supervisor – Augusto Schillachi, Special Effects Supervisor – Randy E. Moore, Production Design – Stephen Lineweaver. Production Company – Relativity Media/Robert Simonds Company. Bob Ho is a spy on loan to the CIA from the Chinese Intelligence Service. He has become involved with Gillian, the next-door neighbour to where he lives and maintains a cover as a dull pen salesman. After his most recent assignment, that of capturing Russian criminal Poldark, Bob decides to quit the service. He wants to settle down with Gillian but faces the problem that her three children Farren, Ian and Nora don’t like him. Gillian suddenly receives news that her father has fallen ill and must leave town to be at his side. In an effort to bond with the children, Bob volunteers to look after them. They however do everything to sabotage his efforts. Bob then receives news that Poldark has made an escape. Ian inadvertently downloads information from Bob’s computer that contains Poldark’s formula for a virus that can eat up oil and plastics. Poldark’s people come after Bob and the kids to get the formula back using maximum force. The Spy Next Door feels like a film that every action star is obligated to make at least once – one where the tough guy must grit their teeth and be left in charge of a group of unruly kids – Arnold Schwarzenegger did Kindergarten Cop (1988), Hulk Hogan made Mr Nanny (1992), Vin Diesel The Pacifier (2005) and Dwayne Johnson did The Game Plan (2007). Indeed, this film’s director Brian Levant put Arnold Schwarzenegger through his family comedy paces once before in Jingle All the Way (1996). In this regard, The Spy Next Door plays out like a mix of The Pacifier – tough guy marine Vin Diesel is required to babysit a trio of kids – with a few dashes of True Lies (1994), a comedy where Arnold Schwarzenegger is a spy who keeps up a cover as one of the dullest men imaginable. With The Spy Next Door, it is Jackie Chan’s turn. In the 1970s and 80s, Jackie Chan emerged as a top star in Hong Kong action movies, usually ones that blended martial arts and comedy – see classics like Drunken Master (1978) and sequels, Police Story (1985) and sequels, Armour of God (1987) and sequels, and Double Dragon (1992). Jackie became known for choreographing his own stuntwork and some of his films during this period are dazzling for the displays of acrobatics and lightning-paced fight moves he conducts. On the other hand, there is Jackie Chan the Hollywood star. Chan discovered a name for himself with English-speaking audiences after Rumble in the Bronx (1995) and especially the comedy hits of Rush Hour (1998) and Shanghai Noon (2002). Both of these have spawned sequels and Chan has spun a new career out playing in lightweight Hollywood comedy. Unfortunately, outside of the increasingly more banal Rush Hour sequels, most of Jackie Chan’s English-language films have been a string of commercial and critical flops – see the likes of The Tuxedo (2002), The Medallion (2003), Around the World in 80 Days (2004) and The Forbidden Kingdom (2008), with the exception maybe of supporting voice work in the hit animated Kung Fu Panda (2008) and sequels. Can one truly say that by the time of The Spy Next Door, an excruciatingly banal film for kids, that any of the legion of fans for Jackie Chan’s Hong Kong hits have made the journey with him and are still watching? The Spy Next Door plays out in ghastly and utterly predictable ways. 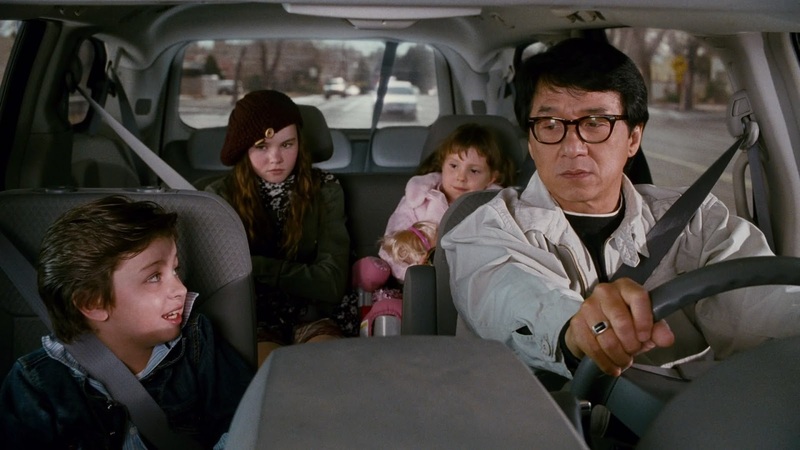 The film has largely been construed around either slapstick fight sequences or cutsie ones with Jackie Chan doing things with the kids – having to wrestle young Alina Foley to get her dressed; running and even swinging around a mall trying to find Alina after she wanders off; chaos in the kitchen as he tries to prepare breakfast and so on. There are a number of gags spun out of Jackie employing spy gadgets in the service of babysitting – using a tracer to find the missing kid, placing remote unlocking devices on the bathroom door, using a miniature blowtorch to cook breakfast or a handheld hooking device to reel in Alina Foley. Brian Levant’s handling of every gag and fight sequence is excruciatingly predictable – you can see everything coming up, where each sequence will go, which implements to hand that Jackie Chan will improvise with in a fight sequence and so on. We even get the utterly bizarre (not to mention ghastly) sight of Jackie Chan breaking into rap at one point. The one plus the film does offer is Jackie Chan engaging in some of the lightning-fast choreographed action sequences he is renowned for (which have mostly been sidelined during his Hollywood ventures) – even if Jackie (who is now in his fifties) is clearly being substituted for by a stunt double at various points. There are some engagingly energetic sequences with Jackie fighting around the kitchen and living room of the house, in a restaurant, employing a bicycle as a weapon and around the backyard of the house using ladders, swimming pools and children’s castles. It is the nearest that The Spy Next Door stumbles towards attaining any life. The supporting cast seems like a case of nobody having bothered. The villains are comic Russian caricatures – I thought the idea of comically over-the-top Russian spy villains was a cliche that died away in the late 1980s but they are resurrected with tedious witlessness here. As Jackie’s sidekick is country singer Billy Ray Cyrus who, as the film points out, plays with a strong hillbilly twang that leaves you cringing as he accompanies Jackie into action. The film’s genre inclusion comes with the villain’s formula – a virus that devours oil and plastics (presumably some nanotech application). The formula is notable for being even more ill thought out than most of the McGuffins that appear in films like these – I mean, what sort of villain with world-conquering ambitions places the copy of his all-important formula on a website, which a kid is easily able to download, with no encryption, with no backup and in a format that would appear to delete the original copy as soon as it is downloaded? Director Brian Levant has made various other mainstream comedies including Problem Child 2 (1991), Beethoven (1992), Snow Dogs (2002) and Are We There Yet? (2005). Levant also ventured into genre material before with The Flintstones (1994), The Flintstones in Viva Rock Vegas (2000), Scooby-Doo! The Mystery Begins (2009) and Scooby-Doo! Curse of the Lake Monster (2010).